This Twisted Wonderland Perfumery order was a long time in the making. I have been following Rae and her fragrant concoctions for a while now. I love the dark fairy tale fantasy world that she crafts with whimsy. Twisted Wonderland offers perfumes, soaps, body care, home fragrance and more. 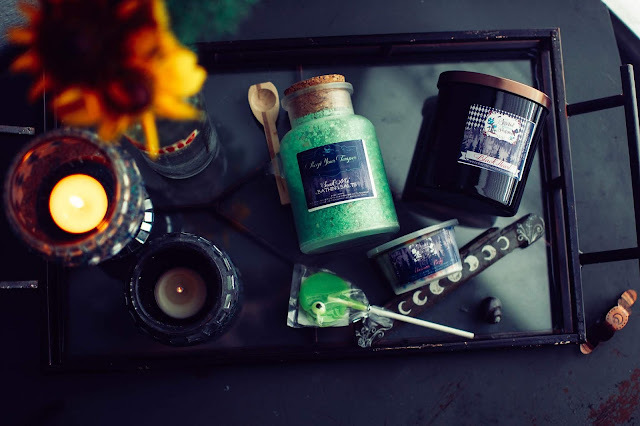 After many trips to the website and much window shopping, I decided upon a candle and some bath salts. My products arrived quickly and packaged well. A nice tasting lollipop and a wax tart were generously included. "Soak Me" Bathing Salts in Keep Your Temper sounded like just the thing I was looking for once I read the notes. These bathing salts can be purchased in any scent of your choice for $11.50 for ten ounces of salts. They come in this really cool plastic frosted apothecary jar with a spoon and a cork lid. 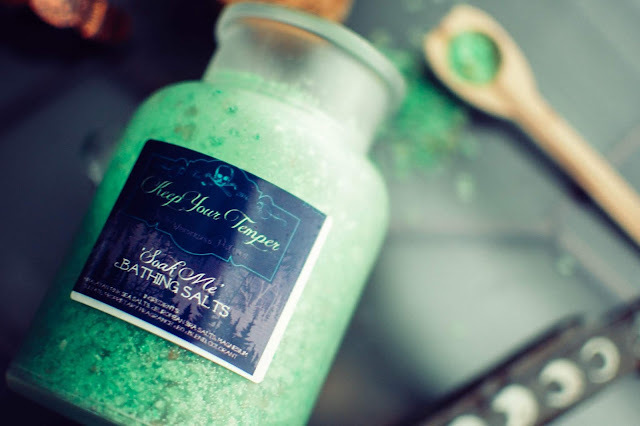 Keep Your Temper- Notes: Eucalyptus, herbal lavender, a sprig of spearmint and a little hint of toasty marshmallow. A sinus clearing bright and sharp eucalyptus greets the senses. I love how powerful it smells. The spearmint is the perfect partner for this scent, adding just a touch of minty sweetness. The bath salts made for a relaxing and fragrant bathing experience. Skin softening and calming. The green glitter and mica was very bright and did have to be cleaned up from the tub but it wasn't difficult. Personally, I am very much the old lady when it comes to glitter and shimmer in my bath but the girls loved it so they will finish this off with relish. I was surprised and delighted to see a scent shot in the box as a free sample. I LOVE how beautiful this wax it. 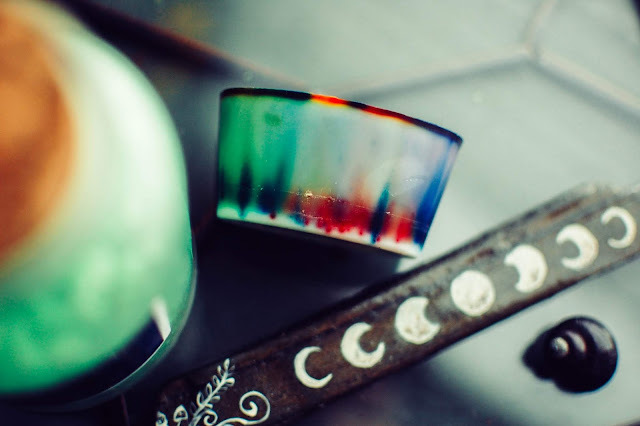 That tie-dye is rad. The scent is just as groovy too. It smells of blue raspberry sno-cones and piles of cotton candy. It reminds me of the blue raspberry Blow Pops too. I remember always getting those at the skating rink. I went whole hog and threw the entire shot in my bedroom warmer and it threw strong and sweet and I loved it. I would purchase it in a heart beat. 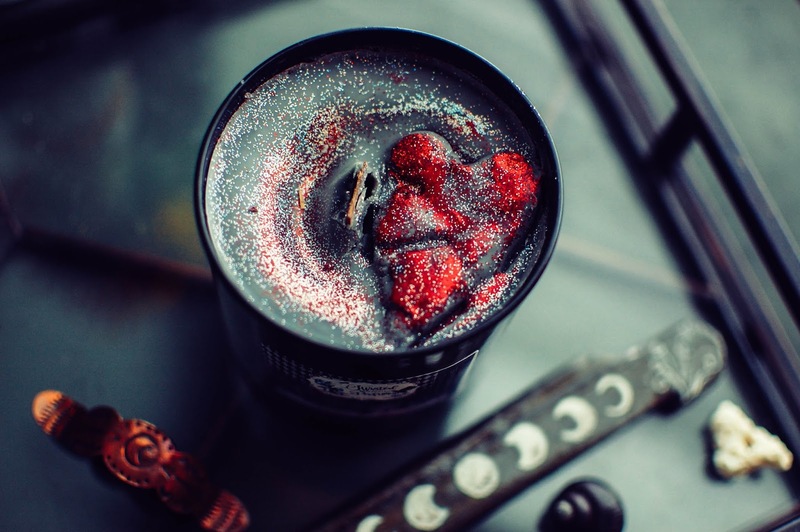 The candle can be ordered much like the bath salts, in that you can list your scent choice in the comments when you check out. The woodwick candles are at the bottom of a drop down menu and run $15 for a 9.5 ounce candle. 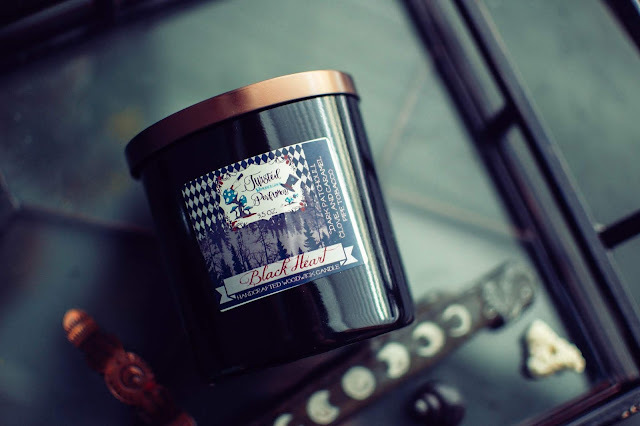 Black Heart- Notes: Dark patchouli, clove and caramel pipe tobacco. This smells even better than I imagined. The smoky black patch and dried tobacco merge perfectly and the added woody yet warm clove makes it bliss. This is how a handsome man with a black heart and a tailcoat might smell. Or a succubus in a red dress. The candle comes in a black glass container with a metal lid. It was beautifully decorated. It lit easily but the flame did not last very long at first. After some tinkering (cutting away the wax, pouring some off here and there) I was able to get it going eventually. 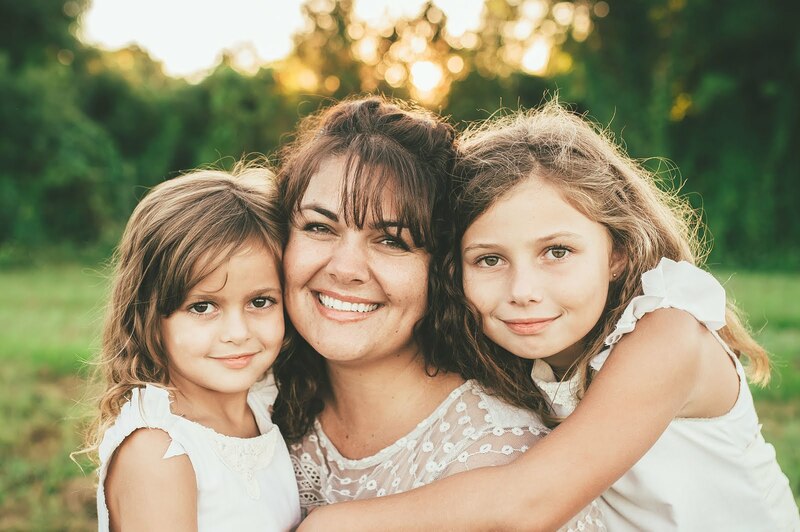 I did contact Rae when I couldn't get it to form that first pool and she did offer a refund but I wanted to work on it and knew sometimes these things happened. It did end up churning along and when it did, it threw nice and strong. Despite the rocky start, it ended up being a stellar candle. I will happily buy it again. In this exact scent. I hope this scent becomes wax tarts eventually too. 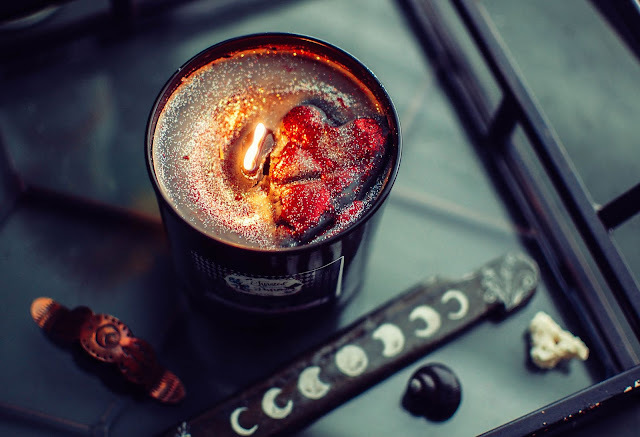 I want everything to smell like Black Heart. I am very happy with my first Twisted Wonderland experience. Rae was very sweet and responsive to my questions and her products show how much she cares for her creations. That Black Heart though. You need that smell. 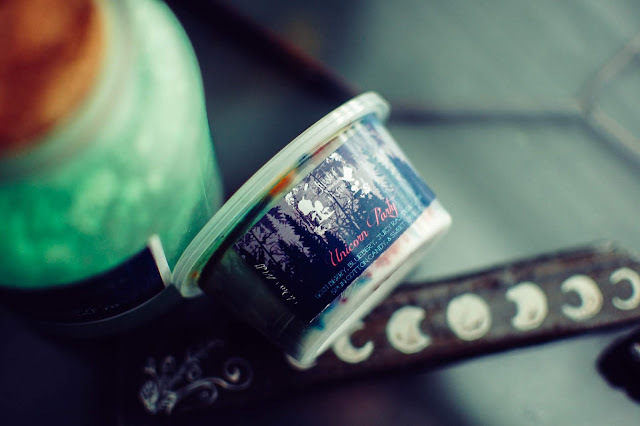 Have you tried anything from Twisted Wonderland? Any recommendations? I placed a very tiny order last year for my sister's friend. I got her a special shaped soap and grabbed one wax scent shot for myself. I was very impressed with the scent and throw of Rae's wax. I would definitely buy wax again and other products from Twisted Wonderland. Hahahahaaa! Yeah! No references to unicorn body functions thank God. But parties are pretty sweet. And it smells sweet. So it fit. Haven't heard this brand's name in forever. Someone I follow was an ambassador or something a while back, but stopped posting. Looks like their scents are more refined now, I'm definitely intrigued, didn't know they did wax. I'm loving this window frame background too (or is yours a tray?) I went to a farmer's market booth with a similar set-up for products and thought I will have to try that sometime, maybe I can find one and refurbish it if not too much. Love the dark color scheme here. Thank you! It is a serving tray that I picked up at an 80% off sale. I decided I had room on my nightstand for one. It was nice and organized at first but now it is totally cluttered. I need to clean again. I bet you could totally refurbish one from somewhere.